THE US JUSTICE Department’s inspector general has announced he will launch an investigation into the department and FBI’s actions in the months leading up to the 2016 election, including whether department policies were properly followed by FBI Director James Comey. Democrats have blamed Comey’s handling of an investigation into Hillary Clinton’s use of a private email server and his late-October release of a letter about the case as among the reasons for her loss to Republican Donald Trump. Inspector General Michael Horowitz said the investigation would look at whether department or FBI policies were followed in relation to Comey’s actions in the case. The review will examine Comey’s news conference in July 2016 in which he said that the FBI would not recommend charges. During his announcement, Comey delivered an unusual public statement for an FBI chief by chastising Clinton and her aides as “extremely careless”. It will also review the two letters he sent to Congress about the case in the final days before the 2016 election. Clinton and her aides said the disclosure of “new” emails — found on a laptop belonging to Anthony Weiner, the estranged husband of Clinton aide Huma Abedin — less than two weeks before election day hurt her in several battleground states. 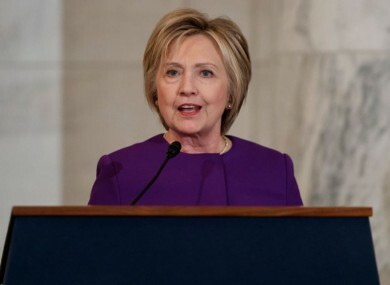 Comey’s action prompted outrage from Clinton and other Democrats who said it needlessly placed her under suspicion when the FBI didn’t even know if the emails were relevant. Email “Watchdog to probe how FBI handled Clinton email investigation ”. Feedback on “Watchdog to probe how FBI handled Clinton email investigation ”.